We'd love to hear from you. Send us an email, give us a call or connect with us on social media. If you're looking for someone specific, browse our directory. 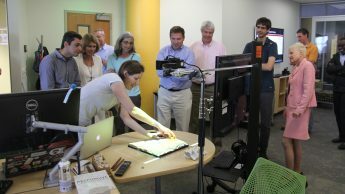 Our cutting-edge Geovisualization Lab is an active innovation space where we advance technologies to intuitively display and interact with geospatial data. We offer an Open House twice a year. Potential partners, funders, and collaborators who are interested in a personalized GeoVis Discovery Meeting are welcome to connect with a Faculty Fellow or Researcher who best represents their shared interests and goals, to schedule a strategic appointment. If you are unsure who to contact for a Discovery Meeting, reach out to Zachary Arcaro.